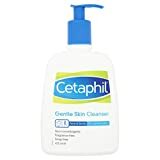 Cetaphil Gentle Skin Cleanser is a mild, non-irritating cleanser that leaves skin feeling soft, smooth and healthy. It soothes skin as it cleans, removing dirt and impurities without stripping skin of natural lipids. It is fragrance free, does not block pores and matches the pH value of skin, making it suitable for daily use even on sensitive skin types. Recommended for gentle, daily cleansing of damaged skin associated with common skin conditions and following dermatological treatments.